So, I got a new tattoo tonight (that makes it sound like I am covered in tattoos, which I’m not). Anyways, the anniversary of my grandpa’s death was last week and I have really been wanting to do something to help me find some closure and some peace with ‘the end of this life’ for him. I’ve had a really hard time with his death (which was on February 4, 2006). My grandpa helped raise me. I felt safe with him. He was the kind of man that made you feel stronger just by being around him. Now granted, strength and wisdom like that also meant that we could NEVER get away with anything (and we most definitely didn’t!!) …but He was the Rock in my family. I remember (pre-D) going to get Frito Pies from the place down the road from the farm that served them in the Frito’s bag and just cut it open and poured the chili inside. We would go down the road and get them, come back to the farm, and sit on the tailgate on the back of his green Chevrolet Z71 truck with our Frito Pie’s after helping “Paw-Paw” all day in the pasture. …And we Loved It. He also wore blue jean overalls with a t-shirt underneath ALL the time. I rarely remember him wearing something else. He was such a hard worker. Never complained about anything and loved being there for his family. He took pride in his work and in his family. Nothing could separate him from the two. I never saw him sick until he got cancer. He got it the same year I was diagnosed with D and the same year other things in my life were pretty crazy. It was pretty rough. He fought for 5 years. Hard. Until the cancer finally took his breath away. His favorite flower was the sunflower. He Loved them. Even though they are technically weeds, he still saw the beauty in them. They grew wild at the farm and along the roads around there, and I remember him planting them at his house.. even right around the time he passed away. At his funeral, there were sunflowers. We laid sunflowers on his grave, and I have since -once- laid sunflowers on his grave again. My grandfather was a special man, and I believe that even the semblance in his love for the sunflower shows the beauty, value, and poise of his character. —He looked at the value and truth about the flower…not just what people-and the world-said about the flower. He believed the best. 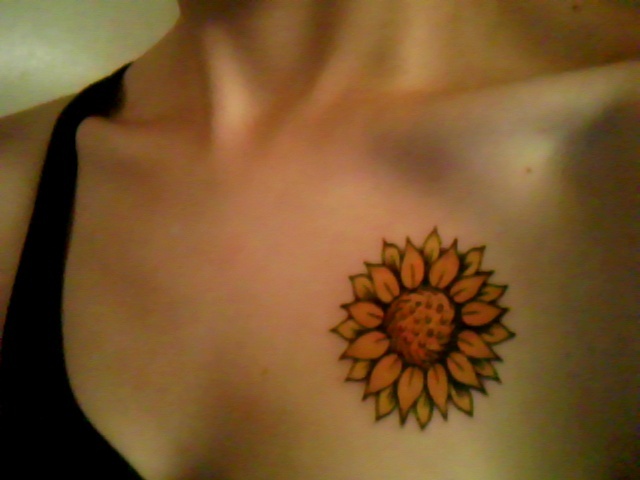 So, I got a sunflower tattooed on the left side of my chest…right above my heart. I’ve been thinking about this for a while, and I finally decided it is what I really want and it’s what I really wanted to do. Grandpa–may I always hold you close…and may I always remember how hard you fought and how you never stopped reaching out to me and being there for me in my struggles, both with D and with other things, even in the midst of your own overwhelming and frightening battle. I love you. Welcome to the ever-expanding DOC, Bekah! Great to share some online space with another great PWD! You wrote a wonderful tribute post for your grandfather, and he sounds like an incredibly wonderful man who helped shape you who you are – the flower is awesome, by the way! Hope the ER and ear infection stuff (read about earlier) has leveled out or is close, and will look forward to keeping in touch via the blogosphere, Twitter, or wherever else the DOC takes us!